Later this week, Jim and I will celebrate twelve years together, ten years married. American singer-songwriter John Hiatt was a part of our early courtship, and two of his songs became our particular favorites – “Feels Like Rain” and “Drive South.” Both appear on Hiatt’s 1988 album, Slow Turning . A true American troubadour, Hiatt has recorded more than 20 albums, beginning with Hangin’ Around The Observatory in 1974 and most recently with Terms of My Surrender in 2014. He’s known for great songs like “Have a Little Faith in Me,” “Perfectly Good Guitar,” and “Thing Called Love” (which became a hit for Bonnie Raitt). His songs have been covered by a wide range of outstanding musicians, from Aaron Neville, B.B. King, and Bob Dylan to Iggy Pop, Linda Ronstadt, and Rosanne Cash. “Feels Like Rain” was the title track of a 1993 album by Buddy Guy, and Suzy Bogguss recorded “Drive South” in 1992, hitting number two on the country charts. Of Hiatt’s many albums, Slow Turning stands out for its rich collection of compelling songs. It’s just one of those albums you have to have – and if you don’t know John Hiatt’s music, it’s a great place to start. You’ll find yourself listening to the album again and again, discovering new gems each time. In addition to “Feels Like Rain” and “Drive South,” it includes such tunes as “Tennessee Plates” (which was recorded by Charlie Sexton for the soundtrack to Thelma and Louise) and “Icy Blue Heart” (which Emmylou Harris recorded for her 1989 album, Bluebird). Back to our two favorite songs. “Feels Like Rain” and “Drive South” are perfect falling-in-love songs. “Feels Like Rain” compares new love to the power of a hurricane. It was featured on the HBO series, Treme, set in post-Katrina New Orleans. In one episode, two characters talk together about what makes Hiatt’s song so powerful. In fact, one of those characters, Harley, is played by none other than Steve Earle, an American troubadour in his own right. If you get a chance to catch John Hiatt live, run, don’t walk, to the concert. My dear friend Karin and I had the opportunity to see him at an intimate concert for 250 people. Despite the persistent heckler who harassed Hiatt throughout much of the show, Hiatt gave an outstanding performance. Near the end of the show, he sang “Feels Like Rain,” then slid right into “Drive South.” I was in heaven! Frequently these days, John Hiatt performs with his long-time friend Lyle Lovett. Sitting together on stage, they take turns performing their songs. Their dual performance is part of a long tradition rooted in Nashville, Tennessee, and Austin, Texas, two great music towns. The “song circle” or “guitar pull,” says San Diego Troubadour, creates a sacred circle of song. JamBase said of one of their shows, “The two are so comfortable with themselves that they make you feel like you are sitting in the living room with them, getting to know them better through their songs.” The New York Times offers a great review of a Hiatt-Lovett concert as well. Whether you’re listening to Slow Turning on your stereo or enjoying a live performance by John Hiatt (and maybe his pal Lyle Lovett), you’re in for a real treat. Rolling Stone offers a retrospective of Slow Turning, with a particular focus on “Drive South” – worth checking out if you want to learn more. And if you want to try your hand at singing and playing Hiatt’s songs yourself, check out the lyrics and chords for “Feels Like Rain” and “Drive South” (both available, with numerous other Hiatt songs, at the John Hiatt Archives). You can learn more about John Hiatt – who hails from Indianapolis, Indiana – in three interviews, one with Jay Hipps in 1994, one with Mark Coenen in 1995, and one with Rolling Stone in 1995. I’m so glad I “drove north” twelve years ago, rocking out to John Hiatt on my Honda Civic tape player as I headed up the east coast to meet Jim at his family’s Long Island beach house. Better believe it, baby! 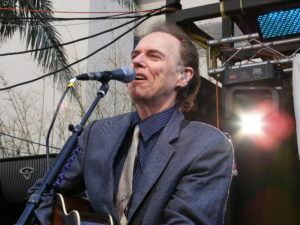 Image Credit: John Hiatt performing at South by Southwest in 2010. Photo by Ron Baker. Used with permission.